One of the biggest changes we face as parents of tweens and teens is the shift from having little kids to big ones, from parenting children to guiding young adults. Often, during the preteen years, our kids can start to pull away. They go from chatting incessantly to holding everything in. Conversations that once flowed freely become nothing less than what feels like pulling teeth, one short answer at a time. As a mom who is watching my oldest make the transition from big girl to young lady, I know her emotions are bubbling just under the surface. I see them in her eyes and watch her demeanor, but it’s not always easy to get her to openly share them with me these days. Connecting with her may be more difficult right now, but it is every bit as important. So how can I do it? 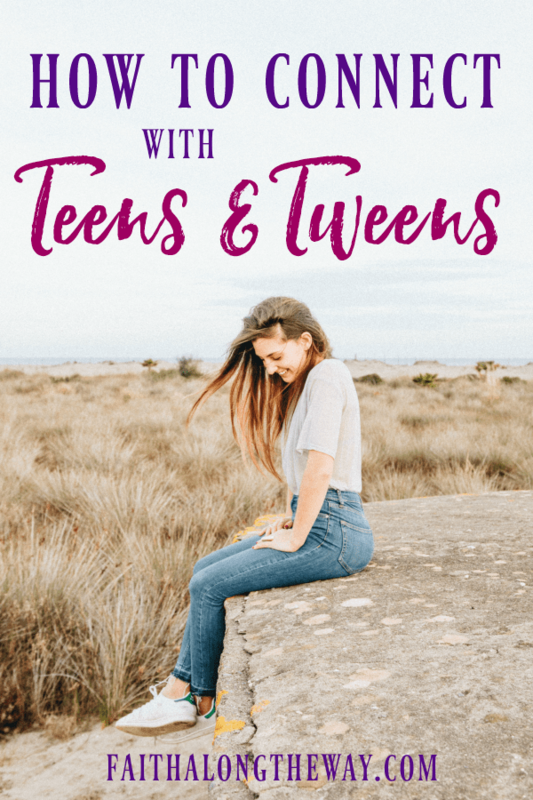 How can we, as parents, connect with tweens and teens, keeping lines of communication open and encouraging them as they grow into young adults? First, we have to pay attention. When our kids were younger, it was easy to see when they were struggling. Toddlers throw tantrums, after all. Teens and tweens still “show out” from time to time, but the signals can be much more subtle. Does she answer you with a bit more sass than usual? Does he stay in his room when he would normally hang out with the family? Interactions with siblings can clue you into stress points as well. Look for changes in behavior and response to normal interactions. We can be tempted to credit our tweens’ and teens’ reactions to hormonal changes, but if we pay attention, we might see a link to stress of which we are unaware. So, how can we get them talking about it? With my daughter, I’ve found it’s important to take time to talk with her one on one. As our kids get older, they naturally desire more privacy. Having a little brother know all the details about her day is no longer appealing. Things she would have shared over dinner a year ago have become stories she’ll only tell when we are alone. For that reason, it’s really helpful to find ways to spend quality time with out tweens and teens. Do you have a common hobby? Could you find one? For example, my older sister runs with her kids, and my daughter and I go walking and jogging. When we’re exercising together, she opens up along the way. One thing I’ve learned about young kids over the years is the fact that when their hands are busy, their tongues will talk. It’s often true of older kids as well. Another great way to connect is to do a Bible study with your kids. The teen years are a time of deepening understanding, as well as of constant questioning. Help them learn to seek answers from God’s word by studying it with them. Perhaps let them come up with questions to which they would like to know the answers and then search out the wisdom of the word together. Choose a book of the Bible to read independently then discuss during a special time each week. Let them see that, though you’re grown up, you’re still learning, too. Whatever you choose, make time to do something with them on a regular basis. The effort it requires to spend time alone with them will speak to their insecurities, affirming their importance and your love. Sometimes that’s all it takes because, during these years of transition, knowing they are loved unconditionally by you and by God can provide a solid foundation that helps them stand firm in an often unsteady time of life. Its easy to use format will help lead your child to a deeper understanding of their time in Scripture and develop a healthy Bible study habit in the process. However you choose to connect with your teen or tween, never stop praying for God to do mighty things in their life. May He grab a hold of their heart and never let go! 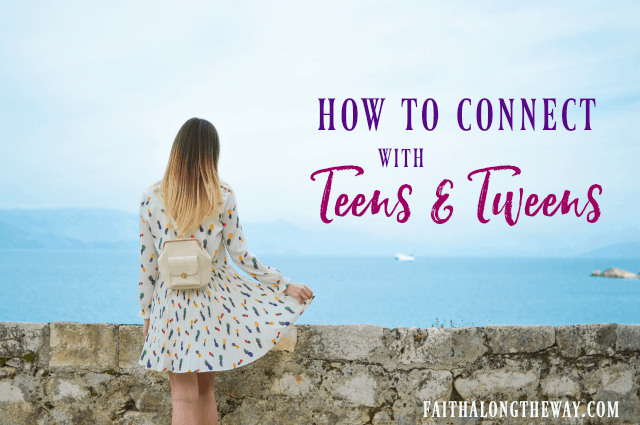 What’s your favorite way to connect with your teen and tween?